Today someone called about a clear-cut property we have for sale. His belief was that clear-cut land is poor deer hunting land. Truth is, nothing could be further from the truth! Clear-cut land is excellent deer habitat! 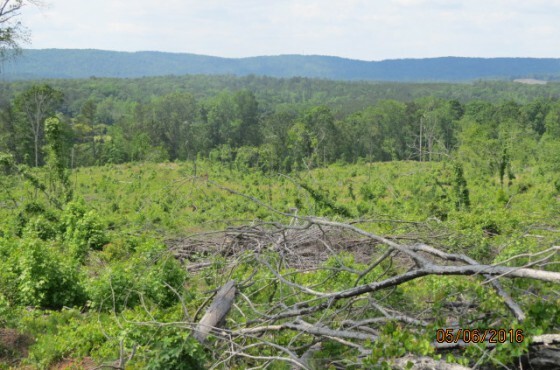 The reason for this is that in the U. S. South, within 6 months of being clear-cut, a property will be completely re-stocked with young, vigorous, thick growth. And, you don’t have to lift a finger or spend one dollar. It comes from stump sprouts and seed already present in the forest floor. For a deer, this does three things: 1) it puts food down where the deer can reach it, 2) it increases the protein content of available food, and 3) it provides excellent sanctuary. So deer have highly nutritious food and cover all in the same place. Something they do not have in a mature stand of hardwood. Importantly, the plant communities that grow back after a clear-cut have much greater specie diversity and have much higher protein content than the mature forest that was there before. While there will not be as many mast producing trees (for example, mature oaks, beeches, etc), there will be much more to eat than before. And it will be much more nutritious (mast is high-carb’s but low protein). The only negative with hunting clear cuts (for the first 10-15 years) is that the vegetation is very thick, making it hard to see deer (which is why it’s good sanctuary). A good way to handle this is by installing a network of stalking trails and shooting lanes organized around strategically placed ladder stands/shooting houses (like the hub and spokes on a bicycle wheel). A clear cut forest is like a blank canvas to a painter. With a spray rig mounted on a 4-wheeler, you can quickly and cheaply turn a clear-cut into a great deer hunting property. And, clear-cut properties are always much cheaper. Of course, they’re cheaper because the value of the trees are removed. But they’re also cheaper because the “dirt value” of a clear-cut property is almost always less than the “dirt value” of the same property with the trees present (give me a call and we can discuss why). It’s a double win! Clear-cut land makes great deer hunting sense and land investment sense!